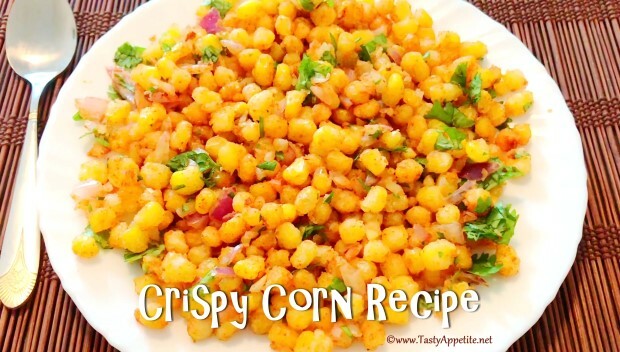 Here comes the easy & quick recipe to make restaurant style crispy corn with mildly spicy flavor. This recipe is very simple to prepare at home. This yummy dish is very popular as a starter or snack. For all the tea time snack lovers, this yummiest snack makes a super delicious healthy treat. Also it makes a great dinner appetizer recipe. Check out this easy video recipe to make crispy corn at home! Take aside corn kernels from the corn cob and set aside. Heat 2 cups of water in a sauce pan. Add corn kernels and cook in boiling water for 2 to 3 mins. Take corn kernels in a mixing bowl. To it add salt and corn flour. Coat the corns completely with flour. Once the oil is hot, add the corn and deep fry until crispy. Add the fried corn to bowl. In another small mixing bowl, add salt, cumin pwd, red chilli pwd and chat masala pwd. Add this spicy masala pwd to the fried corn. Add finely chopped onion, coriander leaves and mix. Squeeze few drops of lemon juice and combine. Delicious spicy crispy corn is ready. It makes a mouth watery snack along with garma garam evening tea or coffee.